Drones are easy to describe, but their intended uses and purposes, on the other hand, aren’t. Namely, they’re used by both youngsters who’re looking for fun, as well as by adults who have a knack for exploration. Now, if you’re looking for the Best Drone Under $200, you might be thinking “what can I do with it?”. There’s a plethora of things you can do if you own one – you can play around with it, observe the skies up front, film magnificent landscapes, and, practically, whatever your mind can come up with. The first drone in our review comes from Force1 – this brand is one of the most famous drone manufacturers, and it’s safe to say that their models are slightly better than most. Simply put, this particular drone comes outfitted with top-shelf features, and it might just be the best drone under $200 we’ve ever come across. First of all, it comes outfitted with a neat 1080P HD camera. With it, you’ll be able to capture high-resolution photos and videos, if such things interest you. On top of that, there are three return-home settings – these modes are remarkably handy if you’re prone to losing things, as they’ll allow you to retrieve your drone via auto-piloted flight if it’s in the vicinity of 500 meters. The controller is as straightforward as it gets, which means that you don’t need any experience whatsoever to fly your Force1 quadcopter. Lastly, this model features a set of brushless motors, as well as a gratis battery pack. Now, it’s easy to see why this model is our top pick, even without the complementary features. Note that this model is also the most expensive ones on our list of top 10 drones. Even though it features a price that is below $200, it’s right near the border. Nevertheless, it holds a massive value for the cash due to exceptional performance and high-grade features. Holy Stone boasts as much renown as Force1 – their models can easily go toe to toe with some of the best drones available on the market, and their HS400 Quadcopter Drone is numbered among their finest works. 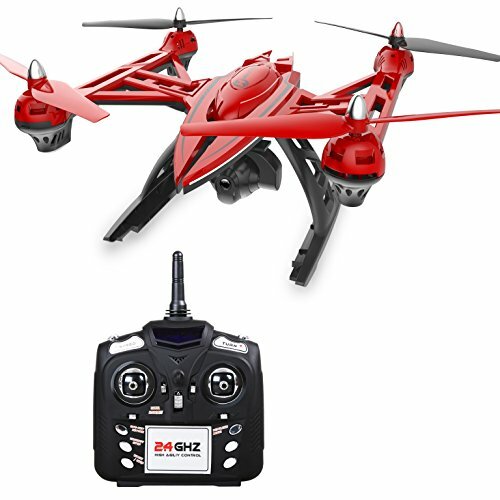 The HS400 quadcopter comes equipped with an adjustable 720P first-person-view camera. You can freely adjust the angle with the provided transmitter, which substantially simplifies the method by which this model works. You’ll also benefit from the automatic altitude-hold function – this feature aims to help people who’re barely acquainted with drones learn the basic methods of operation. Among the other notable features and functions, you can use the one-key return, the “headless mode“, the “triple protection“, “speed control“, and more. Generally, this drone holds quite a value for the cash. Here we’re looking at yet another magnificent drone from Force 1 – the U49W. This particular model features a built-in Wi-Fi which can be accessed through any smartphone device – it allows you to observe the videos you shoot with it as you make them. Though the HD camera could be a better, it is still capable of shooting videos in 720p. 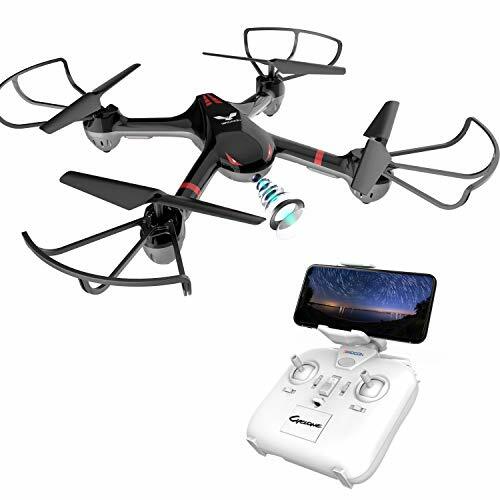 People who wish to gift this amazing drone to their kids are in for a real treat, as it comes with a convenient 1-key button controller (comes with three speeds, although most functions can be accessed with it). With half an hour of total battery lifetime, you can play around with it and still have enough time to shoot some lovely photos or videos. Just like the previous Force1 model we’ve reviewed, this one also comes with the “altitude hold” and “headless mode” options. Even though it’s not the cheapest drone in the middle price point category, it’s still pretty valuable for the money. Next on the list of the best drones under $200 comes DBPower’s UDI U842 Predator Wi-Fi Drone. This model would be considered as average by high-end standards, and superior for its actual cost. It comes outfitted with a high-definition 720P camera, as well as Wi-Fi for real-time feedback and content sharing. 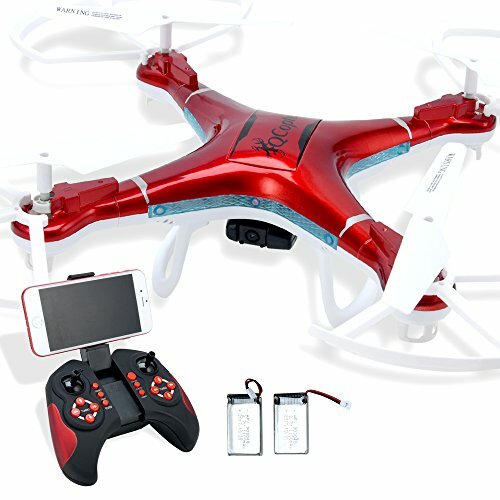 It features the “headless mode” option which allows you to control the drone in the most straightforward way possible, which basically means that it will follow the pathing you ordered instead of following its gravitational vector. The UDI U842 comes with a complementary battery, but, even so, it can last only 18 minutes while fully charged. That’s still better than average drone flight time (widely considered to be approximately 5-6 minutes), but we’ve seen drones that can last twice as much. Nevertheless, it’s safe to say that this model features an exquisite value for the money. 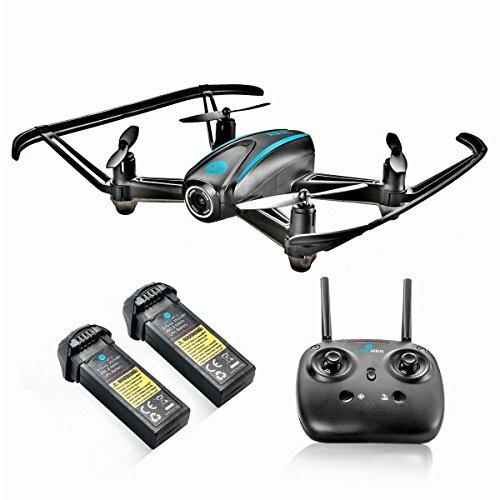 Potensic’s U36WH RC Quadcopter drone made it into our “top 10” list because it features a plethora of gratis features and goodies without costing a fortune. Basically, the vital features you’ll be using the most are the drone itself, the controller, and the Gravity Induction application. First of all, the U36WH comes outfitted with a premium-quality 720P 30fps high-res camera that operates via “Flyingsee” application (it’s available on the Google Play store, you don’t need to register to use it). Apart from that, the so-called “headless system” resembles the feature better known as “headless mode“. It allows the drone to fly unobstructed, as it features special air pressure sensors which help it maintain its stability at certain points. The gravity induction is another downloadable application which will help you fly the drone in any possible direction, mimicking the angle at which you hold the mobile device. 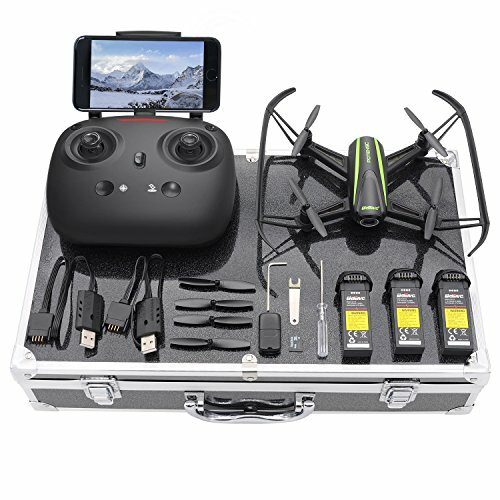 The full package includes the 1-year warranty, the U36WH quadcopter, a carry case, an SD card reader, a transmitter, Wi-Fi 2MP camera, and a set of batteries. Overall, this is definitely one of the best budget drones available. 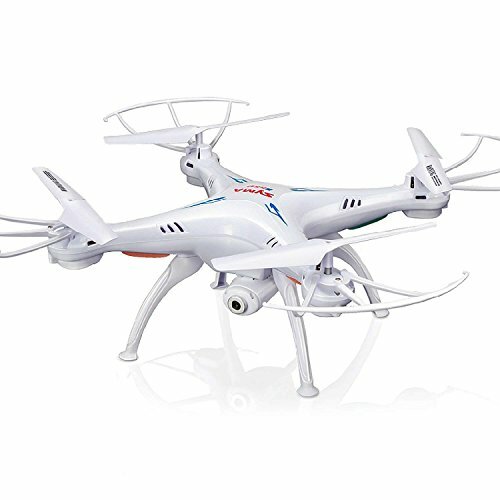 Generally, Altair Aerial’s AA108 RC Quadcopter is one of the best budget drones regarding versatility. It comes outfitted with a vast array of top-shelf features, numbering the premium-quality HD 720P camera, a durable construction, three flight levels, and more. First of all, the camera outfitted with this drone features a 120-degree wide angle. Even though there are better models, this camera is more than strong enough to bring you the wildest, most vivid pictures and videos. Furthermore, there are both Headless and altitude-hold modes, as well as the one-touch takeoff. This substantially reduces the learning curve while simplifying its method of operation. One of the most interesting things about it is that it features custom route modes. This feature will allow you to draw a specific line on your mobile device, and your drone will follow it. Lastly, there are three flight levels you can choose between. the third level is labeled as “advanced”, bringing you a tougher challenge. Overall, this drone doesn’t cost too much, and it certainly does a major bang for the buck. Qcopter’s Drone QuadCopter is built in a plain and straightforward fashion. This quadcopter excels in numerous fields of performance, even though it costs substantially less than the models we’ve reviewed so far. First of all, we’ve noticed that the majority of drones under $200 can only fly for about 10-15 minutes. That’s not the case with Qcopter’s drone, as it can easily glide and hover for approximately 30 minutes. The batteries it comes outfitted with are pretty strong, and they need less frequent recharges when compared to average drones. The overall design of this drone is quite basic, and beginner-friendly above all. There’s a set of vivid LED lights which helps you spot it at night, but we advise that you refrain from such notions, as you might scare someone (oddly resembles NLOs). 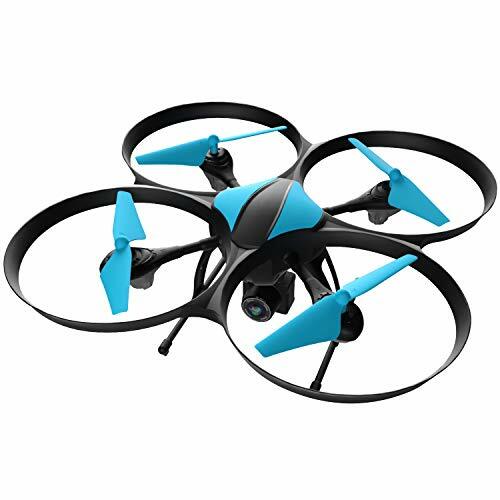 This drone comes with a First-person-view camera, as well as Wi-Fi module, all governed by a convenient downloadable mobile device application. As bonus features, you’ll get a complementary battery and a crash kit. The latter features replacement gear parts, mounts, snap-on motors, propellers, shafts, and other replaceable parts. Given that this is an entry-level drone, it holds quite a value for the money. 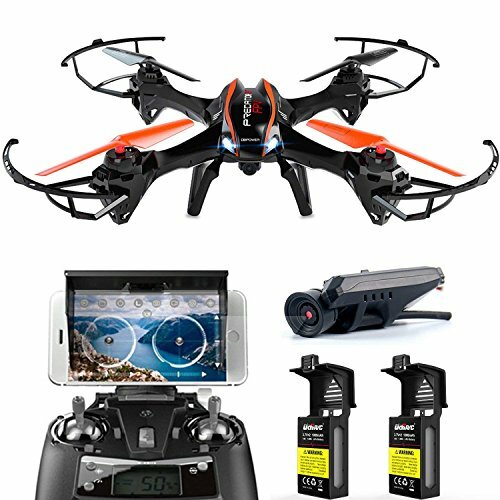 Eachine’s E58 Quadcopter Drone is one of the newest models on the market, and we can safely assume that the E58 might just be the best drone under 200 concerning the easiness of use. It comes equipped with a 2MP wide-angle HD camera which can capture a broad spectrum of high-def videos and pictures. The “altitude mode” feature can be activated with a simple touch of a button, allowing you to accurately pin the position and height of the drone. 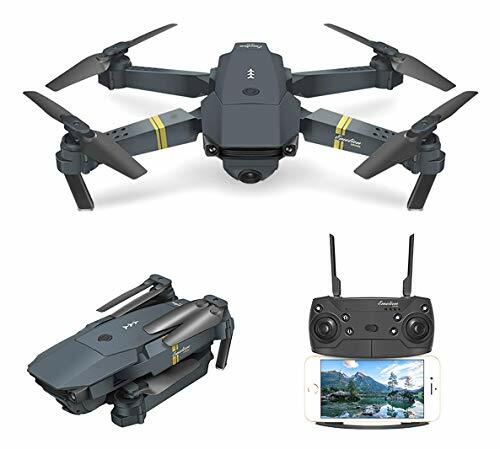 One of the best things about this drone is that it features a convenient, folding design – this makes it one of the most compact drones available for the money, as it’s suitable for all kinds of travels. A single button governs the functions of both taking off and landing, which is why we label it as “user-friendly“. Overall, we’re surprised to see that a drone of such high quality belongs to this price range. Next on the list is Drocon’s X708W first-person-view quadcopter. It comes supplied with an HD camera and a built-in Wi-Fi module which can be utilized for real-time feedback and content uploads. The “headless mode” intends to help beginners figure out how to operate this drone, but there’s more to it than just that. Like most budget drones, this one’s also well suited for beginners. It features a one-key controlling mechanism which can be used to either take off or land your drone. This drone boasts streamline-shape design which substantially boosts the aerodynamics, which further reduces the air resistance while improving the overall stability. There are two speeds for you to choose from – the slower settings aim to help the beginners figure out the basics while the faster setting can be used for experienced drone enthusiasts. For a budget drone, this one’s certainly valuable. The last drone in this review is also the most affordable one we’ve taken a gander at. It comes from the “Cheerwing” brand, and it’s labeled “Syma X5SW-V3“. Even though it’s the cheapest model in this review, it’s certainly not the worst – in fact, it just might be the best drone under $200 in the budget range. 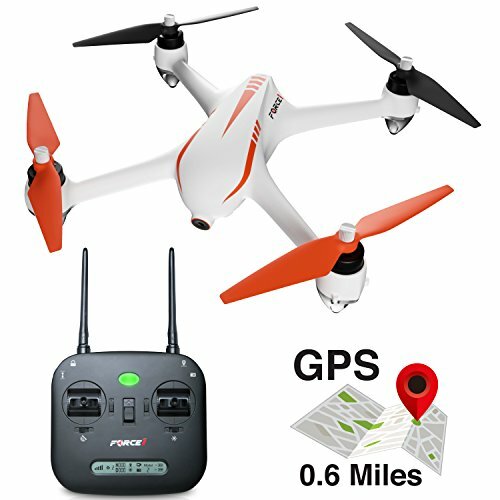 It features the “headless function” which overrides the forward direction pattern while the drone follows the “nose” – using this feature, you’ll be able to change it, and substantially increase its mobility. What’s more, it also features the 6-axis control system, and the 3D lock (resembles the altitude-hold function). The HD camera is truly HD, even though other drones come with better ones. The reason why we’ve picked this drone for our top10 list is affordability above all, but it excels in other aspects of performance – versatility more than most. Picking the Best Drone Under $200 bucks might not appear so hard, but it certainly is – there’s a plethora of brands, all boasting about their models, and sifting through the vast market can be one hell of a job. Nevertheless, we’ve picked out the top 10 models for your convenience, and all you have to do is kick back and take your pick. We wish you all the luck in finding the drone that’s perfect for you!